This site was intended to be a celebration of adventure – to record our preparations for, and then the eventual story of, our “Big Trip”, our “once in a lifetime adventure” as we headed off round the world on our motorcycles. However, all of that changed just after 3pm on Thursday 23rd August 2007, as we made our way back to the campsite on my bike, having been out sightseeing together for Tracy’s birthday. Details of what happened next and over the subsequent weeks are best found in the blog. However, I think now is the time to re-visit the accident and try and piece together what happened in a bit more detail, as over the course of the last 2 months, both Tracy and I have had plenty of time, and a few recurring dreams, to reflect on the accident that has so dramatically changed our futures. Note: There is still an ongoing legal case concerning the accident as such no use of this interpretation should be made without our express permission. The second thing that Tracy and I wanted to work out is how come we ended up with such vastly different injuries. What follows is our reconstruction of the events during the accident, as best as we can determine them. The initial point of contact with the truck was when he swerved into our path, and the front beak (mudguard) hit the front bumper of the truck, just ahead of the driver’s door. There is paint transfer on the beak, and marks on the truck that bear this out. 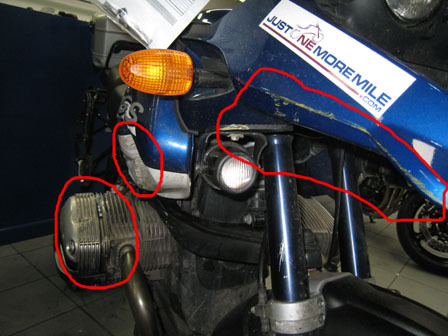 The truck then hit the bike’s fuel tank and right hand engine cylinder (which sticks out into the breeze on a BMW GS) – catching this under the steps on the truck and causing a lot of damage to the engine. As my leg was just behind this point, it seems logical that I would have impacted with the truck also – bearing testament to the strength of the armour in my Dainese gore-tex trousers as I still have my leg… At this point, I recall pushing with my shoulder against the truck to help steer the bike away from the truck and get us away from going under it. Tracy, who was sat behind me riding pillion, recalls me swearing and looking up to see the truck in front of us. Instinctively she put her arm our to protect herself, and at this point she would have been level with the front wheel of the truck, which would have been angled towards us into the turn. Looking at the damage to the truck’s front wheelarch, it seems her arm was caught between the tyre and the wheelarch which is where the damage was done – breaking her elbow and both bones in her forearm and ripping the skin from her elbow down to her wrist. Her jacket was loosely fitting on her arms (in hindsight, a mistake) and so allowed this movement – the only damage to the jacket was a hole at the elbow and one at the shoulder. 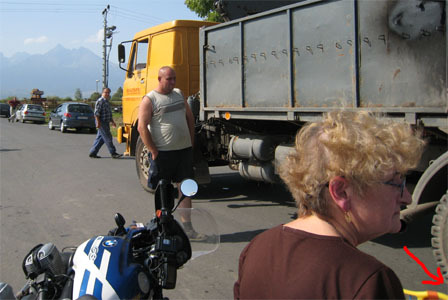 The movement of the truck and the pulling on her arm would have yanked her sideways off the bike – though not completely, we think – and here she looks likely to have hit the truck with some force with her back. 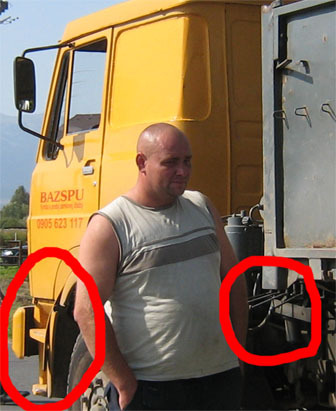 The point of impact could have been the lever controls on the truck as one of these was broken off in the accident and ended up near the bike. That’s almost certainly when her back and ribcage was broken. Meanwhile, my attempts to wrestle the bike away from the truck were successful, as the bike came away from the truck, losing the right hand pannier as it did so. This pannier ended up under the truck’s rear axle, showing that at the point of separation we were still close to the front of the truck. On getting the bike clear, it went into a swerve as the front tyre had been pushed off the rim in the initial few seconds of impact (I didn’t know this at the time, but remember it wobbling like mad), to the extent that it went over on its right side. At this point, it would appear that Tracy was thrown off the bike – we don’t think she was pulled off as her resting position, close to the truck’s back wheel was almost parallel to where the bike ended up, and with the skid-mark left by the bike sliding on its side it looks like she was still on the bike when I finally lost control of it.